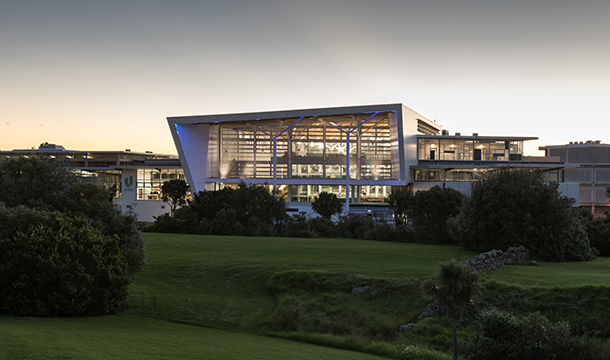 RDT Pacific was engaged as Project Managers for the Hub project at Unitec’s Campus on Carrington Road in Mt Albert. 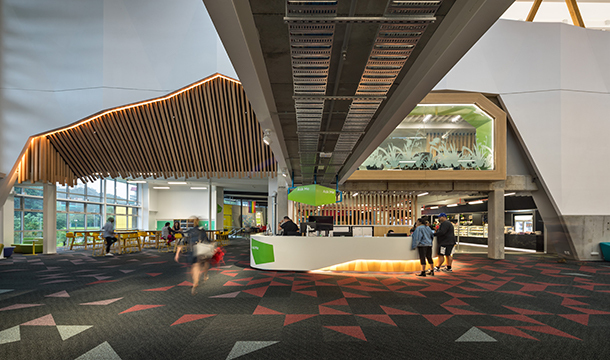 This project, initiated in 2014, is the first step in the transformation of Unitec’s Mt Albert campus. This involves changes to both the physical environment and the pedagogy of learning at Unitec. The Hub comprises 1,286m2 of new build construction (in an existing open air courtyard) and 4,679m2 of refurbished adjacent existing space. An important part of the transformation is to make the campus ‘stickier’, meaning students and staff spend significantly more time there, and interact in new ways. The site was a courtyard enclosed by two and three storey buildings built in the late 1990’s. This space was under-used and unattractive, with significant environmental drawbacks. 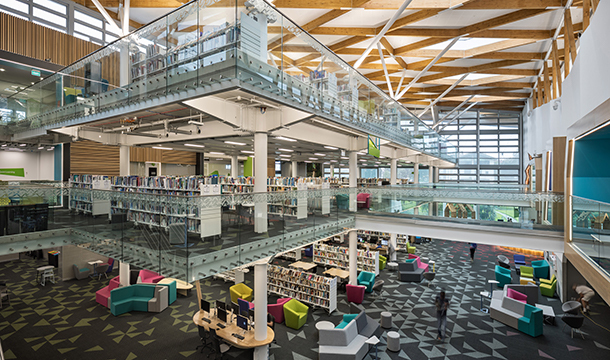 The brief was for a large open-plan social common designed to simultaneously fulfil roles as a library, a social gathering space, a learning environment where students will collaborate and learn from each other, a café and food service space, and a space where a range of student support services would be provided. A visually stimulating interior with a strongly Pacifica flavour was required. RDT Pacific worked with the design team to consider the benefits of sustainable initiatives. A passive fresh air system was integrated based on design modelling and costing reviews. Existing site conditions were captured by a 3D laser scanning process and integrated into the BIM Model which was utilised from the design phase through to the construction phase as a virtual asset to hand over to Unitec’s Facility Management Team. The BIM Model was invaluable during the design and construction phases in detecting clashes and facilitating the design/construction coordination process as well as being a useful visualisation tool for the user group and construction team and also used by the various trade contractors to create construction documentation. Unitec have a state of the art facility supported by a virtual BIM Model managed by Unitec’s Facility Management Team. The business case benefits are being tracked and benefits realised.